Belmond Villa Sant’Andrea is a historic hotel with fantastic facilities and romantic details ideal for couples, families and small groups. 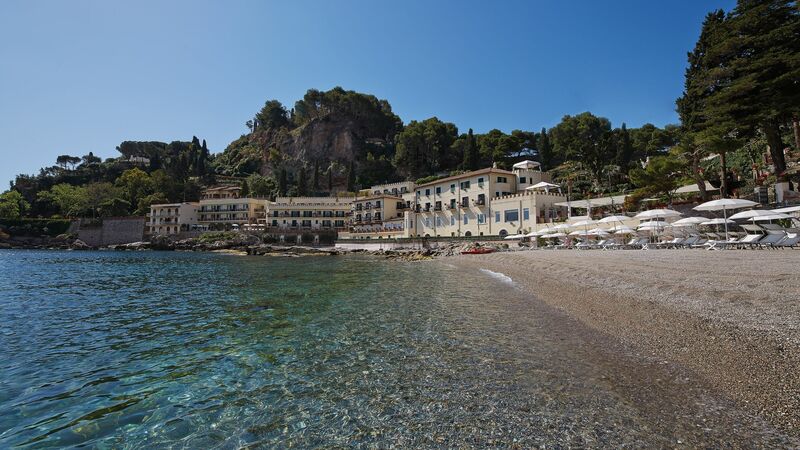 It’s located on the east coast of Sicily, just minutes from the idyllic town of Taormina. There are plenty of opportunities to relax, with an extensive spa where you can enjoy treatments as you overlook the bay, as well as a private beach and a swimming pool. Guests can enjoy excellent cuisine during their stay, with menus featuring local seafood dishes as well as international favourites. 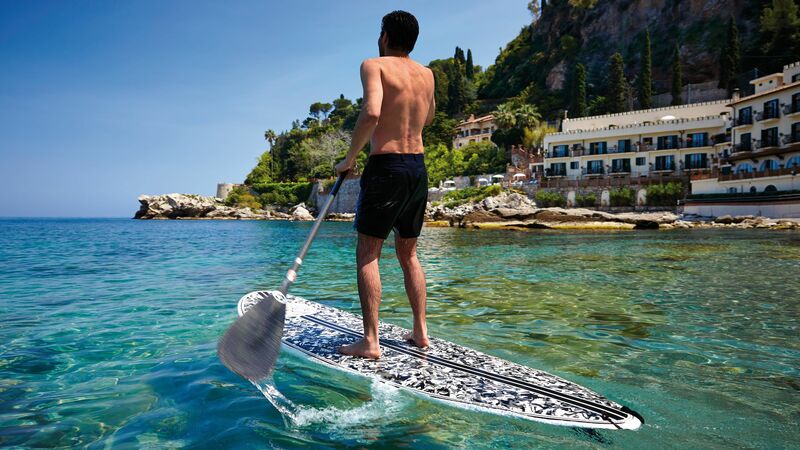 If you prefer to explore further you’ll find wonderful tours available, from wine tasting around Mount Etna to a Godfather tour of the area and boat trips, paddle boarding and lots more. The hotel has 71 rooms and suites. Child prices apply to ages 0-12 years. Seasonal menus are created using local ingredients and feature delicious dishes including risotto, salads and seafood. This is the ideal restaurant for a relaxing evening of dining as you overlook the bay below. Relax and enjoy the views of the bay as you choose from a menu of pizzas, seafood, wines and delicious cocktails at the hotel’s bar. Relax on the white sands of the beach and overlook the bay as you choose from juices, cocktails, ice creams and fruits. 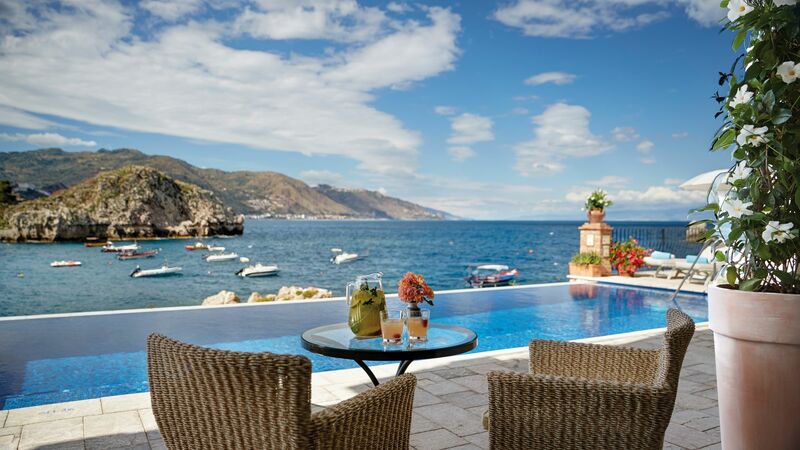 Located next to the Belmond Villa Sant’Andrea’s infinity pool and offering panoramic views of the Mediterranean, this is the perfect place to enjoy light bites, snacks and refreshments. The hotel’s infinity pool overlooks the beautiful bay below and is surrounded by a sun terrace with loungers for a day of soaking up the sun. There is also a pool bar which provides refreshments all day. 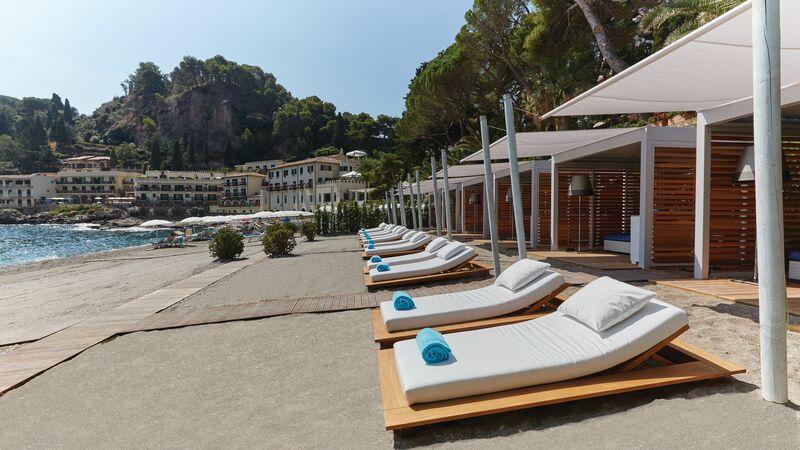 Belmond Villa Sant’Andrea has a private beach full of loungers where you can enjoy water sports or simply relax in the sun. There is also a beach bar where you can order refreshments, cocktails and more. The Smile Club is available for children wanting to keep active and have fun during their stay. Supervised activities and games are run throughout the day and also offer a chance for your little ones to make some new friends. 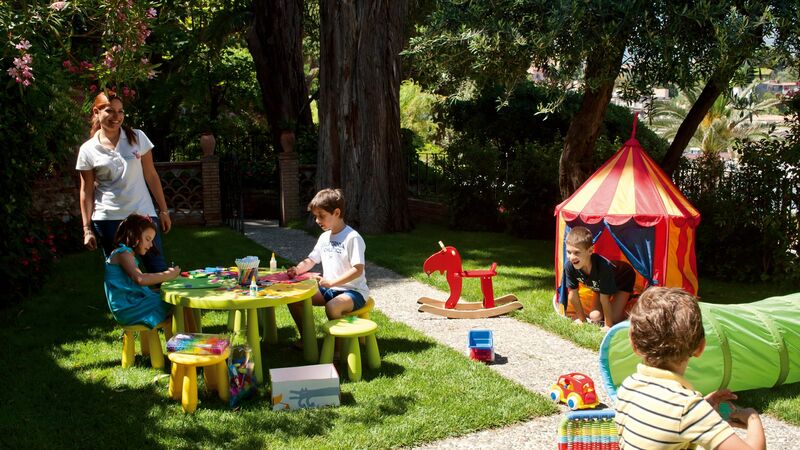 Little extras are provided for children, including their own robe and slippers, a welcome gift, child friendly menus and even special spa treatments. Babysitting is also available on request, and there are PlayStations, iPads, DVDs and toys available at the concierge. Located in the hotel’s luscious gardens and overlooking the sparkling waters of the ocean, the wellness centre is the perfect place to fully relax. Choose from local fragrances during your treatments and enjoy massages, facials and more both in the spa, on the spa’s terrace or in your room. There is also a sauna and a hairdresser available. The Belmond Villa Sant’Andrea’s gym features Technogym equipment to help you keep fit and active during your stay. Beach yoga classes are available on request and will leave you feeling fully revitalised and refreshed. The hotel offers guests a range of water sports, including paddle boarding lessons and boat tours. The boat tour will take you to little coves and hidden bays where you can swim and snorkel or simply enjoy the views. Book the hotel’s Island of Dreams tour and explore this spectacular area with a knowledgeable local guide. Wander through mountain paths and learn about the fruits and flowers which grow in the area, before visiting three island homes. Take a tour with an expert local photographer and explore the rugged cliffs surrounding the town, as well as the streets of the town itself. Enjoy a shopping tour where you will be taken to little known boutiques and shops selling unique handmade gifts and trinkets. Pick up bags, ceramics, clothing and more. Start with a market tour and haggle for your own fresh ingredients, before learning to cook, style and photograph your food. You’ll leave with new skills and recipes to take back home. Visit the spectacular Mount Etna and explore its waterfalls, canyons and pretty little villages. Hike through craters and admire the lava caverns which have been created by this majestic volcano. Visit the area’s ancient Greek Theatre and admire its well preserved architecture which dates back to the 3rd Century. Watch music and plays or simply admire the mountainous backdrop. An Ape Calessino is a moped with room for passengers. Hop on board this classic Italian vehicle and see the streets of Taormina like a local. Stop off for almond wine and a drink at Tennessee Williams’ favourite bar. See the island from above with this bird’s eye view tour where you’ll see Greek ruins and sparkling oceans, as well as mountains, volcanoes and more. Follow in the footsteps of the Godfather film on this unique tour. Stop off for a drink at Coppola’s favourite bar, before visiting the church where Apollonia and Michael were married. Your final attraction is the medieval village of Forza D’Agrò, which you can explore in a Fiat 500. Mount Etna’s volcanic soil provides rich nutrients which yields delicious, unique varieties of wine. A group of experts will take you through some of the area’s best wineries where you can learn the production techniques and taste some of the best varieties. 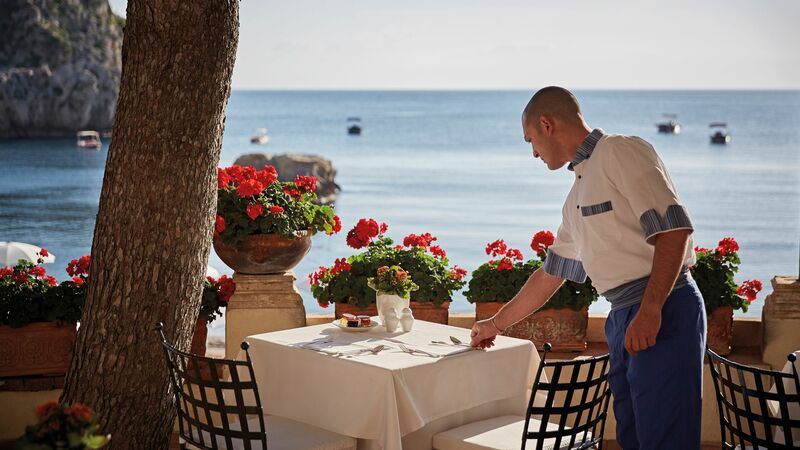 Belmond Villa Sant’Andrea is located on the east coast of Sicily, just minutes from the centre of Taormina. Its beachfront location means you can spend long lazy days on the soft golden sands, or make the most of the sparkling waters of the Mediterranean. Those wanting to explore Taormina will find plenty to keep them entertained. The town is home to ancient Greek ruins and some excellent bars and restaurants. If you prefer to explore the island’s landscape there are boat trips available, as well as day trips. Hike up Mount Etna and visit its village and wineries, or admire the views from the top. Alternatively, visit pretty coves by boat, or spend the day wandering the pretty streets of the town. 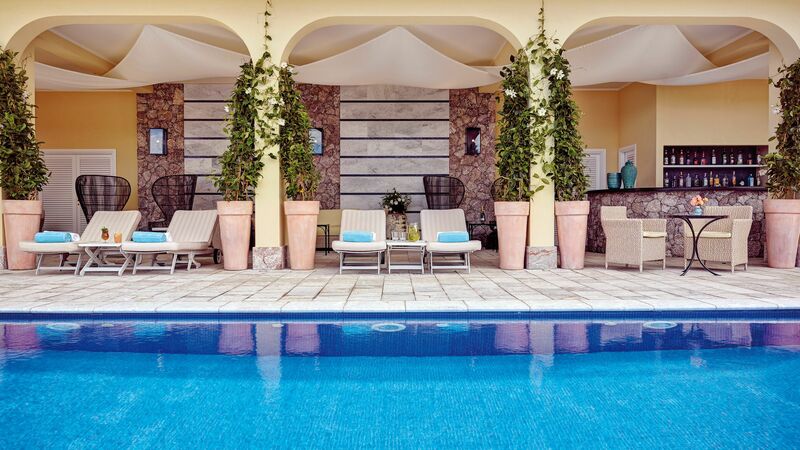 Belmond Villa Sant’Andrea is a 45 minute drive from Catania Airport. Choose from a king size or twin beds and enjoy the elegant modern décor and views of the hotel’s courtyard. There is also a satellite TV, air conditioning and a large en suite bathroom. Enjoy the elegant modern furnishings and décor in these bright, spacious rooms. Take in views of the bay from your large picture windows or French balcony, or enjoy the satellite TV, air conditioning and a large en suite bathroom. These modern rooms have neutral and elegant décor, as well as large windows and a small terrace or balcony with views of the Mediterranean. Guests can also enjoy satellite TV, air conditioning and a large en suite bathroom. The large, elegant rooms offer chic neutral décor and large windows and balconies with views of the bay below. Choose from king size or twin beds in the bedroom and relax in the separate sitting area. There is also a satellite TV, espresso machine, air conditioning and a marble en suite bathroom. These spacious suites are beautifully decorated with rich fabrics and colours. They offer a separate bedroom with a king size or twin beds, as well as having private balconies or terraces with garden views. There is also a comfortable sitting area, a satellite TV, espresso machine, air conditioning and a large marble bathroom, some with a separate bath and shower. These vibrant and elegant suites offer plenty of space and amenities, perfect for a luxury holiday. There is a separate bedroom and living room, as well as a large balcony where you can enjoy views of the sparkling sea below. Guests can also enjoy king size or twin beds, satellite TV, an espresso machine, air conditioning and a marble bathroom with a separate bath and shower. PROS: The location is very nice, with terrific sea views. Great ability to shuttle to the sister property (Grand Hotel Timeo) and explore the Taormina city right from there, plus the gardens of Timeo itself. The staff was absolutely fantastic, anticipating our needs, very efficient when it should be like that, entertaining and chatty if you wish so, and always smiley and caring. The reception, the restaurant, the beach service, the house keeping - all doing phenomenal job..! We have been celebrating a birthday there, and so I go timely in touch with the hotel about much needed special arrangements.. Not only they did delivered everything as planned, but also managed to plug a couple of nice surprises there tooo - Bravo! The deluxe room we had was with spacious terrace overlooking the sea, really beautiful view..! The house keeping is out of this worlds, even for luxury hotels - they overlooks the rooms I think at least 3 times per day, with brush up, small perks & nice touches. The food in restaurant was excellent, we eaten dinners there all the nights, as well as lunch sometimes. Great wine list selection, also they have barbeque dinner on Sundays and we made arrangement for the Candlelit dinner on the beach which was absolutely spectacular, and the way it is setup and serviced, makes you really feel exclusive. Breakfasts are sumptuous, fresh food, a la cart choice in addition to buffet and a lot of sweet pastry. All at all - excellent property with charm, character and stunning service. CONS: There are couple of things to note down, which may appears as drawbacks, derived from the matter of location and hotel's origin. The rooms are small. Our deluxe room was probably around 30m2 (excl terrace) and it feels tight even for just 2 small persons. With the price range of 1000eur+ per night, that's not a best deal overall. Next - there is only one pool, and in reality it is very-very small (looks bigger on pictures than it actually is). We got mosquitos in our room, even the door to the terrace was mostly closed and only open shortly. I haven't noticed the repellent or electronic mosquito blockers to address that, so we got a number of bites, unfortunately. The beach is nicely organized, but there is no cooling kit or water served by default, which was a big surprise to me (they do serve some ice-cream etc through the day, though). Lastly, the address given by the property, when entered into navigation, didn't lead me to the hotel at all, so had to stop and research myself. We were two couples, related, and came here for my brothers first "out of country" experience. It turned out wonderfully... the service, hospitality, and quality of the rooms were great. It sits right on the water. Free water taxi cruises, great pool, beach side service, and an unusually high level of caring. This hotel is very close to the town of Taormina, and in fact has a free shuttle to it's sister hotel right next to the theater ruins. Rooms were decent sized and luxuriously appointed with beautiful views of the beach as well as a small patio. Beach there is a rocky one, so be aware.